To those who were following my blog (kung meron man! :-), I am sure that you are aware that I am a part of the Pag-IBIG Fund Chorale. Aside from working with my day job, the wooden souvenir business "Wooden" and the travel agency "RedMark Travel and Tours" that we recently launched this year, I've been singing with this choir for more than 18 years now. From Soprano 1, Soprano2 , down to A1 and now a power Alto 2, (naks! oh sya ang lahat dinaanan ko na), harmonizing with your friends I guess is my best stress buster so far. Last September 13, we recently joined the CSC Government Choral Competition held at the Cultural Center of the Philippines and we bagged the following awards : Best in Regional Entry - NCR, 2nd Runner-Up and Best Conductor Award. We did not make it as the Grand Champion but in our hearts we did our best and we are champions in our own rights. Our very own version of Joey Ayala's "Karaniwang Tao" is one for the books. Our soulful rendition almost made me in tears and had chills running down my spine. Kudos to our quartet, Darwin, Leebeth, Roderick and Betchay. Maraming Salamat po sa lahat ng sumuporta! 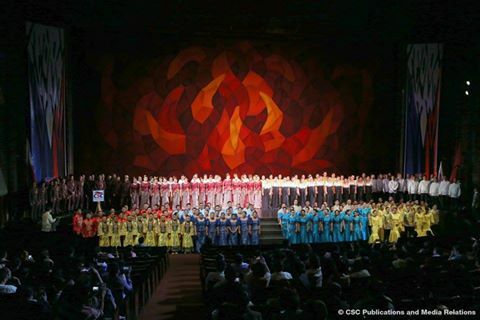 Grand choir - The eight participating government choirs sang “Mabuhay Ka, Pilipino” as this year’s grand choir piece conducted by Mr. Arwin Tan of the Philippine Choral Directors Association. After which, they also gave a rendition of the "Awit ng Serbisyo Sibil"
For the second time, Mindanaoan choir Tagum City Chamber Chorale emerged as the grand champion of the nationwide choral competition for government agencies. 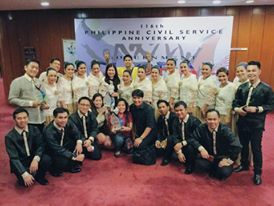 The Tagum City Chamber Chorale won over seven other government choirs from Luzon, Visayas, and Mindanao which competed in the 6th Government Choral Competition on September 13, 2016 held at the Cultural Center of the Philippines in celebration of the 116th Philippine Civil Service Anniversary (PCSA). This year’s anniversary theme, “Sigaw ng Lingkod Bayani: Malasakit para sa Taumbayan, Kapwa Kawani, at Kalikasan”, inspired the selection of the competition piece “Karaniwang Tao” by Joey Ayala at Ang Bagong Lumad which calls on the public to take care of every human being by taking care of the environment. “Sinama namin ang kalikasan sa tema dahil naniniwala ang Komisyon na ang pagmamalasakit dito ay isang pangkalahatang responsibilidad—pangkalahatan, dahil walang pinipiling edad, kasarian, relihiyon, at lahi ang mga sakuna o kalamidad na dulot ng pagbabago ng klima o climate change (We considered the environment in our anniversary theme because the Commission believes that taking care of the environment is a collective duty—collective, because the disastrous impact brought by climate change knows no age, gender, religion, and race),” CSC Chairperson Alicia dela Rosa-Bala said. Each choir sang the contest piece “Karaniwang Tao” with original choral arrangements each, along with two other music pieces. The participating choirs are: (Luzon) Dasmariñas City Teachers Chorale, Pangasinan Provincial Chorale, (Visayas) Guimaras Capitol Chorale, (Mindanao) Bayugan City Educators Chorale, Tagum City Chamber Chorale, The Davao City Teachers Chorale, (NCR) Bangko Sentral Singers, and Pag-IBIG Fund Chorale. Best Regional Entry winners are Pangasinan Provincial Choral, Guimaras Capitol Chorale, Tagum City Chamber Chorale, and Pag-IBIG Fund Chorale. Following its victory in last year’s Government Choral Competition, the Tagum City Chamber Choral won again as this year’s Grand Champion (P200,000), followed by the Bayugan City Educators Chorale (1st Runner-up - P150,000), Pag-IBIG Fund Chorale (2nd Runner-up – P100,000), and the Pangasinan Provincial Chorale (3rd Runner-Up – P75,000). Other special awards were given to Mr. Anthony Villanueva of the Pag-IBIG Fund Chorale for Best Conductor, and to Mr. John August Pamintuan of Tagum City Chamber Chorale for Best Arrangement of Competition Song. 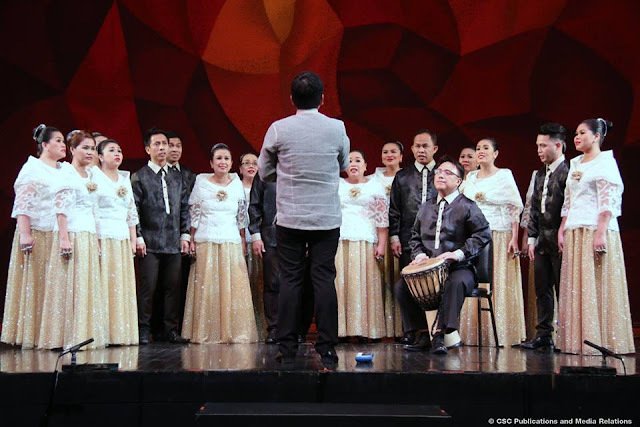 Cultural Center of the Philippines President Raul Sunico congratulated the choirs and showed appreciation for the public servants’ increasing level of appreciation in culture and the arts. “I am glad that people in the government are starting to recognize the important role of culture and the arts in spurring national development,” he said. All participating choirs sang “Mabuhay Ka, Pilipino” as this year’s grand choir piece conducted by Mr. Arwin Tan of the Philippine Choral Directors Association. Mr. Joey Ayala sat as member of the board of judges together with Mr. Jonathan Velasco, Ms. Ma. Theresa Vizconde Roldan, Mr. Ralph Hoffman, and Mr. Tristan Ignacio. Pilipinas Got Talent first season winner Jovit Baldivino and the Silly Peoples Improv Theater rendered intermission numbers, while broadcaster Kara David and comedian/actor Garry Lim served as the Masters of Ceremony. The competition was organized by the CSC Regional Office No. 4 in coordination with the National Commission for Culture and the Arts, and the Cultural Center of the Philippines.